Hi, I am interested in your 1969 Rolls-Royce Silver Shadow (stock #4699-ATL) listed on Autotrader for $24,995. I'd like to get more information about this vehicle and confirm its availability. Its the model that arguably became most closely associated with the revered Rolls-Royce nameplate over the years and aptly captures vintage luxury in outstanding 60s style. This 1969 Rolls-Royce Silver Shadow is Old Money on wheels, first providing its opulence in Sweden before venturing stateside, where its surprisingly solid condition still holds the promise of many future miles of driving enjoyment. As the 60s drew to their mid-point, the Silver Shadow emerged to inject vitality into the Rolls-Royce brand. More compact in length than its predecessor, the Silver Cloud, the Silver Shadow managed to pack a lot more in a smaller space while vastly improving on ride quality and overall drivability. The chocolate shade on display here is not only the original color but likely the original paint and while the stateliness of this classic is far beyond question, a freshening up at the paint booth would elevate its aesthetics to a substantially higher level. Whether you opt to go that route or drive it as is, the foundation here is very solid - youll find no evidence of bubbling from corrosion anywhere and from front to back, the exterior alignment remains very precise. The inherent awesomeness of its brand is generally a strong deterrent to customization and that holds true here - it remains in thoroughly stock condition and its chrome and trim also look very sharp for a car of its era. To refer to this Rolls as a survivor doesnt really do it service. Its a decided thriver , as just one look inside its doors will prove. Throughout, the tan interior is in unusually good condition, with front buckets that have held their shape well and a rear bench seat that looks downright unused. To each side, the door panels still cling snugly their frames and feature burlwood accents that are in top form. The dash area is another strong area - it features a burlwood panel of its own that encircles its array of gauges - all of which still work as intended - with a supple-looking dash pad running across the top. The overall functionality here is very impressive - the air conditioning is running strong, the AM/FM/cassette deck still stands ready to provide its era-appropriate technology for your listening pleasure and even the clock accurately keeps up with the passage of time. The power buckets glide into just the right position and the power windows roll up and down without a hitch. Rest assured that therell be no delay in getting this classic out on the road to enjoy its automotive majesty. Its 6.2 liter fuel injected V8 sits in a very clean engine bay, surrounded by components that have a consistent, scrubbed-clean appearance. The engine is in great working order, firing up promptly and pulling with enthusiasm. In fact, this Rolls is a great driver in all respects - in addition to still retaining plenty of power, its automatic transmission shifts with precise smoothness and whether cruising or braking, it tracks arrow-straight. The suspension is nice and firm without being too harsh and benefits from the self-leveling technology Rolls licensed from Citroen to provide a very refined, comfortable ride. Despite debuting in an era where solid rear axles were nearly a given, this classic has an independent rear suspension to provide skip-free motoring over uneven surfaces, while power disc brakes at all four corners bring its set of 15 stock wheels wrapped with Michelin Symmetry tires to reliable stops. 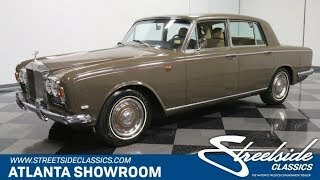 Its not often you get the chance to pull true automotive royalty into your garage, so this 1969 Rolls Royce Silver Shadow is a rare find. Call today!